The Game Has Changed — Have You? PricewaterhouseCooper’s Health Research Institute (HRI) conducted a survey released this year that compares Affordable Care Act (ACA) exchange rates to the employer-based market. 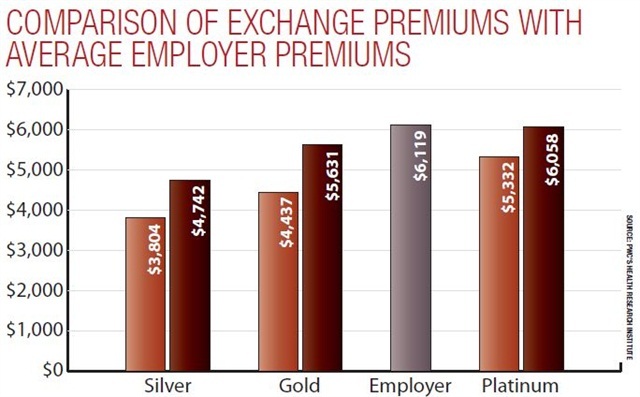 This graphic reveals that the average employer-based plan falls between the gold (80% of healthcare costs covered by the plan) and platinum (90%) levels created under the 2010 law. Your customers purchase supplemental protection products to make their trips enjoyable and stress free. But can your business get that same “complete protection” piece of mind from the Affordable Care Act (aka Obamacare)? Important financial, political, constitutional, regulatory and taxation issues exist. But in this article, let’s focus on those changes that will make a positive impact on your bottom line — specifically, changes that have taken place in the individual health insurance market that will provide a major competitive advantage to those business owners willing to do something different. Group health is an employer-sponsored health insurance plan that is typically one carrier, one plan and one network. The employer picks the plan, pays the bills and decides how much to deduct from employees who wish to participate. Individual health is health insurance that covers individuals, their children and spouse or partner. It is purchased via the Health Insurance Marketplace (sometimes known as the health insurance “exchange”) or also direct from carriers, local agents or private exchanges. If you are one of the few business owners who feel that the group health insurance market has worked well for you and your people, you can stop reading here. The other 99.9% should proceed. In 2013, about 180 million people purchased health insurance through their employer while 12 million purchased their own coverage. Those purchasing their own coverage prior to 2014 were able to save 30% to 70% over those who purchased via their employer. Why? Because insurance companies could pick and choose healthy individuals to underwrite, while a group plan by nature has to take everyone. Obamacare changes all of that. Yes, the cost of purchasing your own coverage has gone up compared to pre-2014 individual plans, but according to ­PricewaterhouseCooper’s Health Research Institute report (February 2014), the premiums found on the exchanges are 4% to 20% lower than comparable group health plans. And now everyone gets covered. This is why experts expect a major change away from group health over the next decade. How many businesses are offering group health insurance because they felt this was the only way to provide quality coverage at an affordable price to their employees? Many. How many of these businesses would be better off dropping their group health plan? Most. So where do you get this coverage? Most people think that they must purchase it from one of the 51 unsecure, dysfunctional Obamacare websites (generically referred to as “exchanges”). This is not so. Purchases can certainly be made from public exchanges such as healthcare.gov or newyorkstateofhealth.com, while the same rates can be found directly from the carriers (e.g., Blue Cross or United Healthcare), from local agents or web brokers such as eHealth.com, as well as from private exchanges. 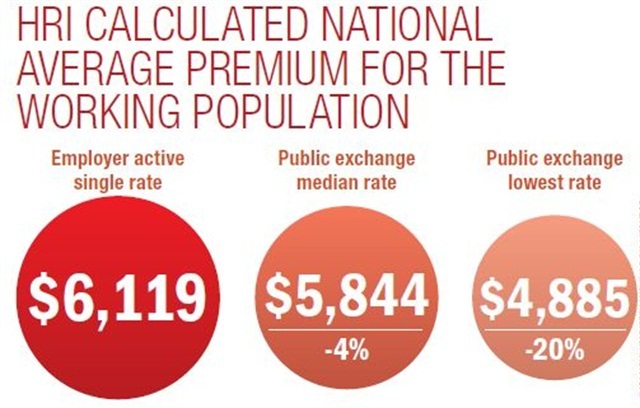 HRI analyzed the average premium costs for the working population nationally in the public exchanges, and calculated that the median 2014 premium for a plan with coverage similar to that of the average employer-sponsored plan was $5,844. By comparison, the average employer premium for a single worker was $6,119, a difference of about $275, or 4%. Average of Gold and Platinum rates (comparable to an average actuarial value of 85% for employer provided plans) pre-subsidy. 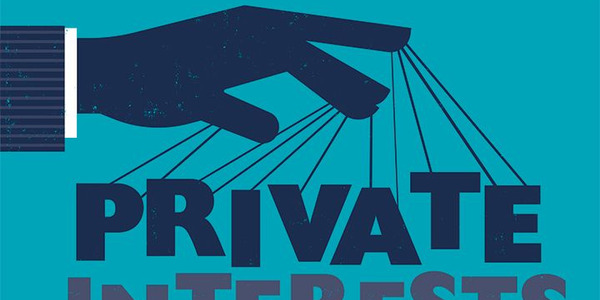 Many of these private exchanges have been created to help employers of any size leverage the changes in Obamacare to increase predictability in labor and health-care costs. Add in expanded Medicaid and significant financial assistance for people not offered affordable group health, and you have the foundation for changing the game at your business. Everyone gets covered; no pre-existing conditions are excluded. Rates are determined by age, geographic area and smoking status only. The same benefit levels exist in group and individual markets. Expanded Medicaid means free coverage for those earning $15,000 or less per year. Financial assistance in the form of premium tax credits and subsidies means payments of $25 or less per week for good (Silver) plans for those earning under $20,000, and less than $50 per week for those earning less than $30,000 per year. Employers with fewer than 50 employees working 30 or more hours per week have no Employer Shared Responsibility (the $2,000 fine) to navigate. For employers with more than 50 employees, simple solutions allow you to take advantage of these changes without spending the additional $2,000 per employee. Either way, here are a few ideas that you can put to use in your business today. Studies show that if you do not offer benefits such as health insurance, you will not be viewed as a top-tier employer. Simply put, that means your cost of labor will be higher than your competition — you’ll have to pay higher wages, you’ll have higher turnover and you’ll attract fewer applicants while being forced to hire lower quality candidates, among other problems. But who said benefits were limited to the health insurance plan that the employer picks? If you offer a health plan, you have seen your costs and hassles double every seven or eight years. That is not sustainable. In addition, there is a mind-set that puts forth unrealistic expectations of a company health plan, which leads employees to not want to pay for health insurance and expect that this health insurance will pay 100% of everything. 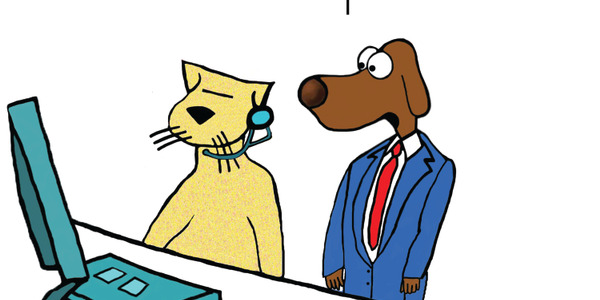 If you can afford to pay 100% for a plan that reimburses employees 100%, that is great. For the rest of you, you can combine the tax benefits of a group health plan with the lower prices of individual health insurance — all without the administration and compliance burdens of group plans. It sounds fancy, but this means that you decide how much you want to provide to your employees. Think of this as a health-care expense allowance. Here, employees decide if they want to add their own money into the mix. You can make this tax preferred (business deduction + tax-free income + pre-tax employee contributions) by establishing IRS-approved Portable Health Care Accounts. The key here is to not make people feel like they are being “dumped on by www.healthcare.gov.” Utilizing a private health insurance and benefit exchange can provide education and personalized consultations so people who want health insurance can make stress-free purchase decisions. To sweeten the pot, make sure services include enrollment into Medicaid, CHIP (the Children’s Health Insurance Program) and Premium Tax Credits to help employees on the low end of the income ladder. In addition, be sure to give access to voluntary benefits such as life, accident, critical illness, dental and vision that can be purchased directly by the employee and paid via pre- or post-tax payroll deduction. As well, make sure your employees have continuous support for navigating the health-care system once employees have insurance. This can be done through a “telemedicine” system, in which U.S. doctors are on call to provide diagnoses and advice as well as to prescribe medicines. A personal health advocate (PHA) can also help navigate the system by finding providers, scheduling appointments, searching for lowest cost treatments and negotiating bills. This will provide you with considerably less headaches and increased profits because you retain the two most important aspects of group health insurance: business tax preferences and payroll tax preferences. This approach to health care makes sense for any company that does not offer benefits now. For those of you who offer benefits, changing your approach allows you to stop being responsible for something everyone hates and start being appreciated for something everyone loves. Bet you didn’t think Obamacare would give you that. Craig Scurato founded Simplifi Benefits in 2012 to provide employers a full-service Private Health Insurance and Benefits Exchange. 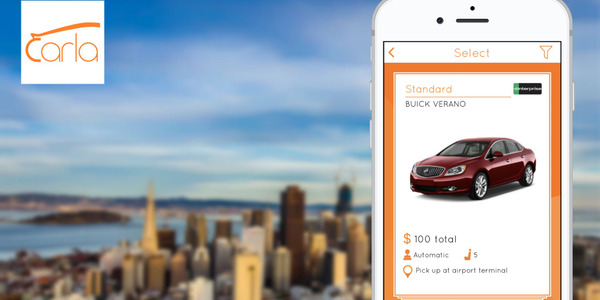 Through the partnership, Rentalcars.com will have access to the brand new Cover Genius XClaim API, technology that enables instant payment of claims into more than 90 currencies. The partnership will help travelers purchase full coverage with $0 deductible protecting them from out of pocket expenses. 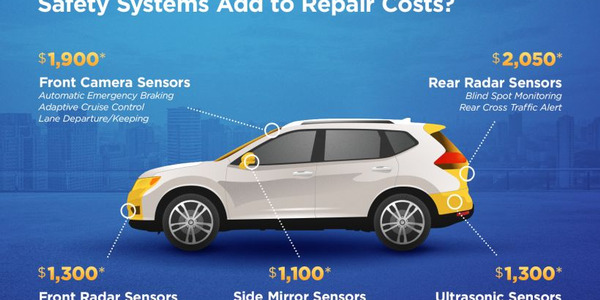 Vehicles equipped with advanced driver assistance systems (ADAS) can add on average an extra $3,000 to the repair bill after a crash due to pricey sensors and their calibration requirements, according to new research from AAA. A police spokesperson said the uninsured vehicles were due to an oversight, and the companies took immediate steps to insure the vehicles. 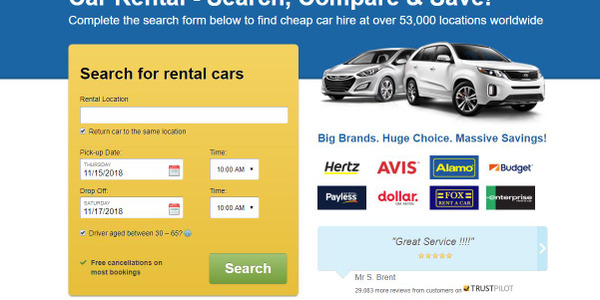 Some rental agencies are reporting business upticks as much as 15% higher than usual during this time of year. Experts give tips on how to remain professional when dealing with difficult situations such as vehicle recovery, subrogation, or chargebacks. The police raid of a car rental company in Detroit leads to questions on how insurance fraud investigations and prosecutions are funded — and the motivations driving the players on all sides. 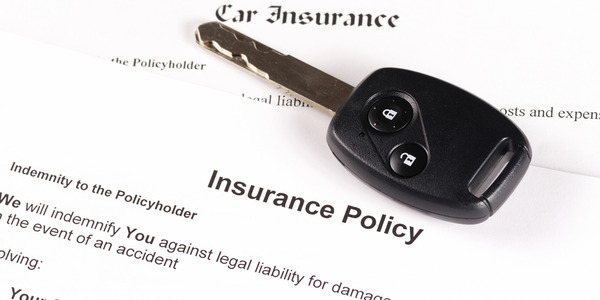 Using this tool, you'll be able to better respond when insurance adjusters try to lowball your damage claims. 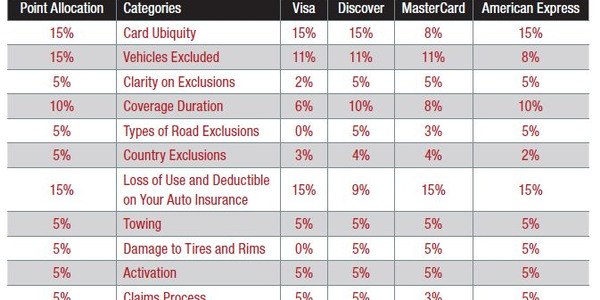 CardHub report finds that types and levels of coverage vary greatly by card; American Express named as having the best coverage.